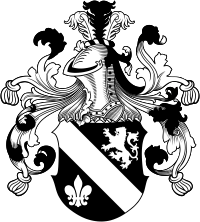 The title of nobility gave the rank of a nobleman in the social hierarchy. Many nobility titles were originally function names. To distinguish from the title of nobility is on the one hand the title of predicate (the title), on the other hand the nobility predicate. Hierarchy of titles of nobility and english Titles: Emperor, Empress, King, Queen, Archduke, Archduchess, Grand Duke, Grand Duchess, Duke, Duchess, Grand Duke, Grand Duchess, Elector, Electoral Prince, Prince, Princess, Sovereign Baron, Souvereign Baroness, Marquess, Margrave, Marchioness, Margravine, Earl, Count, Countess, Palsgrave, Imterial Count, Landgrave, Landgravine, Raugrave, Wildgrave, Baron, Baroness, Knight, Nobleman, Sir, Dame. 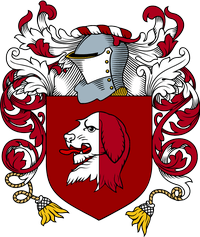 With each title of nobility you get the right to use one of the following three coats of arms, whether on the stationery, business cards or homepage: For their proper appearance as a representative of the nobility. After the payment we send your Nobility Titles as pdf with E-mail. 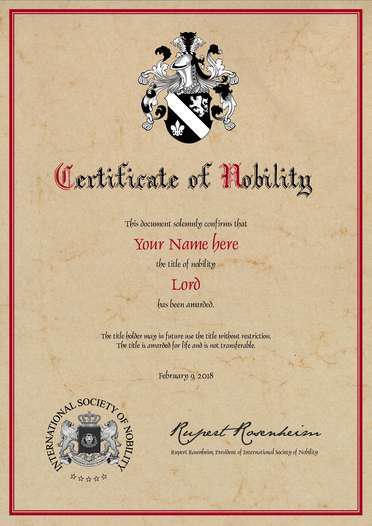 A very special gift: Buy nobility titles from Lord, Baron and many more. All Nobility Titles are licensed by the International Society of Nobility Titles in New York (USA) and Paris (France). The titles of nobility were the most common in Europe. Many royal families have made it into modern times, for example the british queen, spain and many more. 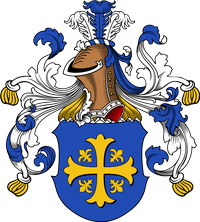 European title of nobility, equivalent to a British earl, ranking in modern times after a marquess or, in countries without marquesses, a duke. The Roman comes was originally a household companion of the emperor, while under the Franks he was a local commander and judge. The counts were later slowly incorporated into the feudal structure, some becoming subordinate to dukes, although a few counties (or countships), such as those of Flanders, Toulouse, and Barcelona, were as great as duchies. The reassertion of royal authority over the feudatories, which took place at different times in the different kingdoms and led to the formation of centralized states of the modern type, meant that most counts lost their political authority, though they retained their privileges as members of the nobility.